First of all, you need to determine when do you want to wake up every morning. For me this time is 5:00 AM. There are many factors that may determine it and it may take a while until you get used to it. But it is worth it! Prepare breakfast (for me and my family). Do some mundane chores that nobody wants (get the dishes out of the dishwasher, clean the kitchen). Quick stretching (this step is very important if you do not want to injure yourself). Do a chore while cooling down (e.g. squeeze orange juice, or do the dishes or whatever). Another chore (e.g. prepare breakfast). Another chore (e.g. put your lunch into the oven). Another chore (e.g. finish preparing breakfast). Another chore (get your lunch out of the oven and into your lunch box). Planks (count to 20, relax counting to 5 and count again to 20). Finish your exercise routine with a silent cheer: “YES!” That would make it feel like an achievement. Finalize whatever tasks are left (dishes, juice, breakfast or lunch). Do 20 minutes of walking around the house (see this article for more info), or about half of your daily steps. Put on my headphones and start something educational (I currently listen to Harvard Business Review podcasts). Every now and then get your bottle of water and drink. After you are done, drink your juice (I do 1 orange and 1 lemon, no sugar). You can make your coffee here and drink it on your way to work. I did not get to that routine from zero to hero, but I rather expanded and improved it over almost 3 years. So I do not recommend to start like that. To be honest, I think I started with something like 2 x 5 push-ups and 2 x 5 squats and I increased the number every month or so. Practicing discipline means following the same routine over and over again, until it turns into a habit. A habit means that it is easier to do something, that not do it. Even if you are an entrepreneur and you work from home, it is highly recommended to plan time outside. There is nothing more depressing than staying home and working all day every day. This is the best possible time to spend some time with your kids, while taking them to school. Or even to drive your significant other to work. But what I find most productive is having a nice and long walk outside to get some fresh air (if you intend to do that, you can skip the 20 minutes walking from the previous section). If you decide to take your kids to school, or to get your significant other to work, be present. Do not think about work, tasks or whatever. If you find yourself alone, use the time to educate yourself or to relax and preserve energy. Keep your mind off work topics! Avoid checking or answering emails! You could even put your phone on DND (do not disturb). This way you will reserve this time for you. Do not hurry, but rather enjoy your travelling time. Drink your coffee while travelling and forget caffeine for the rest of the day. I personally get my kid to kindergarten and we use the time to communicate, even though he is too young. Then I just spend the drive to my office in complete silence. Practicing deep breathing or mindfulness can be a great way to spend your time and get to work as energized as possible. Another great way to spend your time before work is to travel with the public transportation system. Get a book, or put some music on your phone and just enjoy the ride. You finally get to the office, energized and you feel eager to start tackling some tasks. You should spend your time doing the important tasks first and not the urgent ones. If you get used to doing that, your urgent tasks will decrease over time. You have to do what you are supposed to do, so that your managers (or customers) will be happy and you will continue to earn money. Prioritize your task so that you can always know which are the important ones. Update the priorities regularly. Work on the most important tasks. Remain productive for the entire working day and not just burn out in the morning. Preserve enough energy for yourself and your family. Review your tasks from the previous day. Review your emails (for more information about how to keep your email organized read this article). Do all tasks that come from emails and that can be done in 2 minutes or less. Choose the 3 MIT (most important tasks) for the day. These are your top priority tasks. Eat your breakfast during those Pomodoros. I am sure some will argue that this is now healthy. I agree, but I still do it. If you are lucky to be home, you can do your meditation wherever you find peace and quiet. If you are in an office, you can lock yourself in the toilet. Nobody will notice those 15-20 minutes. I am sure there will be a lot of people to object here. Start with the MITs and work on them until you finish them. Avoid interruptions (close email, close social media, put your phone on DND). If your environment is too noisy and distracts you, put some music on. Preferably something without lyrics and no songs that you really like and would distract you. Remember to rest after each Pomodoro! Use the toilet which is furthest from your desk. Walk to it and do not think about your tasks. Drink water to keep you hydrated. Drink at least 2/3 of the water that you are supposed to before noon. Let at least 1 hour pass after breakfast and before drinking water. Do not eat for 30 minutes after you have drunk water. If you absolutely need caffeine get it now and not after lunch. Preferably go out with colleagues. You might learn something new or find new friends. Otherwise go outside for some fresh air. Do not watch YouTube while eating but instead allow your brain to relax a bit. I do it now and than and I do not recommend it. Another good idea is to use the lunch break to go for a walk and do the groceries (parallelization one more time). More work: Spend the last (two or three) Pomodoros working. Hopefully the MIT are already done. If not get them done. Set aside some time at the end for closing: summarize what you have done, prepare your time-sheet and leave a note for the next day. You can release the gas pedal, because you have already done enough today. Some of the urgent tasks from the morning can be tackled at this time. The power of an afternoon nap is immense. People like Leonardo Da Vinci did it, so why don’t you? Once again if you are in an office, you can lock yourself in the toilet. Make sure you do that if you did sleep well. Do not spend more than 20 minutes napping. Do not do it after 3:30 PM, because it might affect your nightly sleep. Drink the remaining 1/3 water for the day. Under any circumstance avoid caffeine. If you get hungry prefer nuts over carbs. 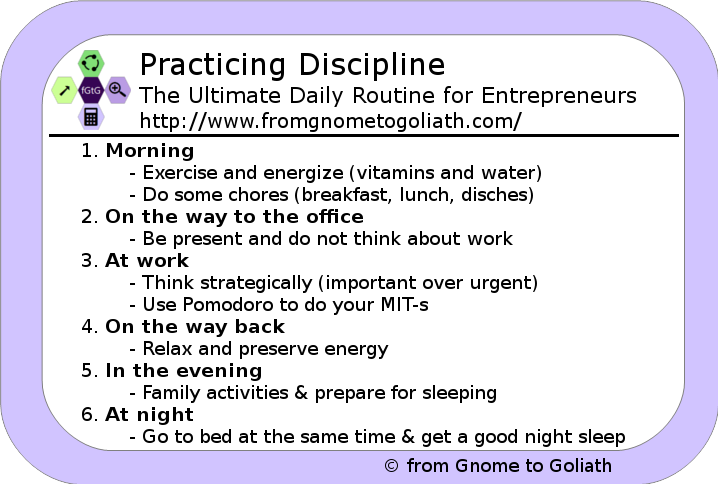 Just like your morning routine, practicing discipline at work will be hard, but fruitful. Once you get used to the basic stuff, you can try to play around. Getting back from work should be all about relaxing and recharging. I have tried reading on my way back, but I find it counterproductive. I have tried working on the way back (on a train), but I usually make more errors than finish tasks. A good suggestion is some energetic music with deep breathing (if you are driving) or some relaxing music with meditation (if you are travelling). I have tried napping on the way back (on a train), but it is not very productive as it messes my night sleep. If possible you get your kids from school, or your significant other from work. Hopefully, you have enough energy left to enjoy a nice evening with your family. You can prepare the dinner together, or play some games, or even go outside. It is not recommended to drink water, because it will make you get up during the night. It is recommended to eat light and to do it before 7:00 PM. Plan at least 30 minutes to prepare your mind for sleeping: no TV, no phone, no laptop. These devices produce light that tricks your mind into thinking it is a day. Getting a good night sleep is very important for your well-being. It helps reduce stress levels, it helps you recover brain cells and so on. Plan enough time for sleep. The most important rule that I follow is that after the 6th hour of sleep, you can plan your wake up on every 45 minutes. That means 6 hours, 6 hours and 45 minutes, 7 hours and 30 minutes of sleep are best for your health. I try to go to bed at the same time (even on weekends), so that I create a habit. No TV, laptop, phone or tablet at least 30 minutes before going to sleep. No frightening or exciting books! 🙂 I am sure many will laugh here, but I am honest. You need to be calm to go to sleep easy. No thinking about tomorrow, problems, tasks, work or whatever. In the morning you concentrate on getting your body and mind in shape for the upcoming day. You take care of blood circulation and freshness. On your way to work, you spend time with you kids and/or your significant other and you talk to them, keeping your mind off work topics. You could also read/educate yourself and set aside time for growth if you travel alone. At work you try to squeeze as many tasks as possible, but you keep the pomodoro time intervals. Concentrate on important (strategic) tasks and not on urgent ones. You relax in the breaks and even meditate. On the way back you discharge yourself from the workday and relax so that you have energy for your family. In the evening you spend some more time with your family, you prepare and have dinner together, you play games or what a movie. You set aside about half an hour to prepare your mind for sleeping with a book or something that does not involve a screen. You go to bed at approximately the same time and follow your routine before going to sleep. This way you can wake up fresh every morning, have great results at work and have enough time for your family!